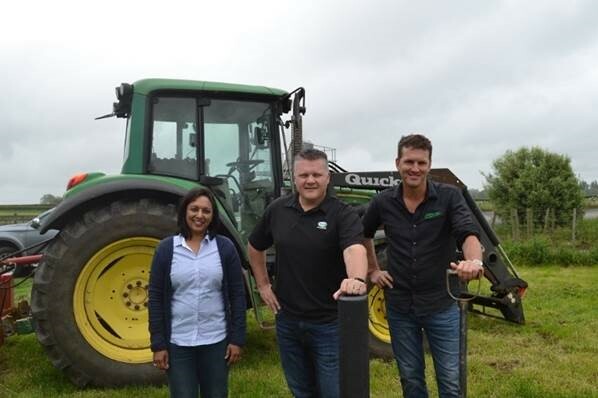 Fonterra Brands New Zealand’s (FBNZ) Sustainability and Environment Manager, Larisa Thathiah, says the posts are an innovative new way for farmers to improve their on-farm sustainability. “This partnership provides farmers with an environmentally-friendly fencing option, made from the packaging of our farmers’ milk, which is pretty special,” she says. Miles Hurrell, Jerome Wenzlick and Larisa Thathiah. Anchor™ Light Proof™ milk bottles are collected from the Fonterra Takanini site and transported to the Future Post™ Waiuku plant, where they are mixed with soft plastics and turned into fence posts.